living a healthy, happy life – without letting allergies get in the way! 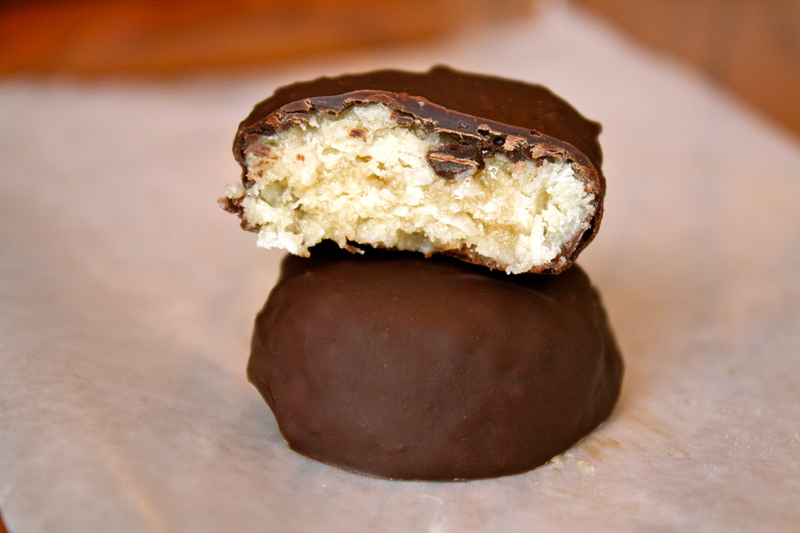 So, when I stumbled across these No-Bake Coconut Crack Bars, yet another fantastic recipe by Chocolate Covered Katie, I knew I had to make them. However, I wanted to do something a bit different. 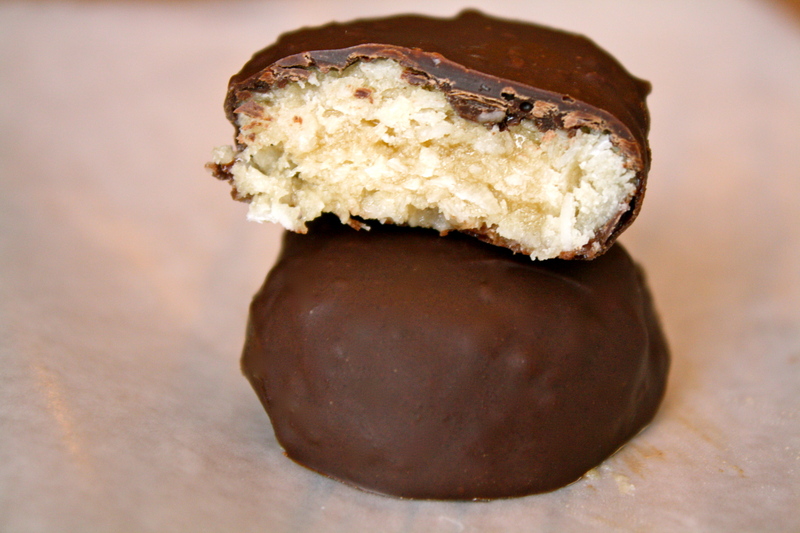 I had just made those Sea Salted Dark Chocolate Bars, and that gave me the idea to turn the Coconut Bars into Mounds! Combine all of the ingredients in a food processor, and blitz until they come together in a sort of “dough”. Press dough into the bottoms of a mini muffin tin. Allow candy to solidify in the fridge for at least one hour. Melt chocolate chips in a microwave-safe bowl. Pop one of the candies out and onto a fork, letting it rest on the tines (in other words, don’t stab it onto the fork 😉 ). Dunk the fork and candy into the chocolate, take it out, and tap tap tap the fork along the side of the bowl, allowing all excess chocolate to come off. 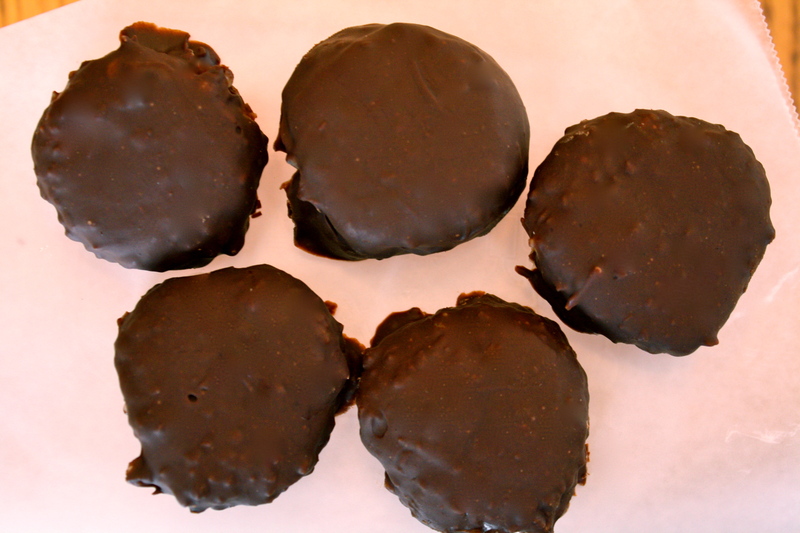 Place the coated candies on wax paper, and allow them to sit in the fridge for about an hour. It’s really difficult to resist them, but I found that they were much better cooled off than straight out of their chocolate bath! Store in the fridge. Enjoy! – If you don’t have a mini muffin tin, you could simply press the dough into the bottom of a 7×5-inch container, as Katie suggests, then cut it into bars. Now, I’m not going to sit here and complain about Hershey’s candies (! ), but it really is amazing to see the difference at-home cooking can make! oh lord. I don’t even think I should make these. They look TOO delicious. I want to eat them all. These look delicious! I love CCK recipes. I made her cookie dough balls with beans and they were actually really good! So far I’ve loved all of them, too! I’ll have to make those cookie dough balls…they sound gooood! Wow! Those look like bought from the store. You are good at this! Sadly I can’t do honey, but I’ still hopeful to manage this recipe somehow. Thanks! Thank you! The original recipe calls for agave nectar or liquid stevia…does that help? Stevia is good! Though I try to avoid artificial sweeteners as well, I wonder if it’ll work with just dark chocolate?..